Mildred C. (Walker) Beckley, aged 95, passed away on March 23, 2012 in Florida. She was preceded in death by her husband of 61 years John W. Beckley. Survivors are; her daughter Barbara (William) Gibson, of North Port, Florida; grandchildren John (Julie) Gibson, West Allis, Wisconsin; Erica (Todd) Miller and great-grand children Devin and Tyler Miller of Waukesha, Wisconsin. Mildred was born May 8, 1916 in Albion and resided there until 1997 when she moved to Wisconsin and later to Florida to reside with her daughter. In 1951 she started and managed the hot lunch program at Albion Jefferson School. In 1953 she and John purchased their first restaurant. John and Mid's Restaurant became well known for her home cooking, good service, and most of all for her homemade pies with the flakey crusts. Mildred retired and the restaurant closed in 1981 after 28 years in business. She leaves behind many wonderful and happy memories for her family and friends. 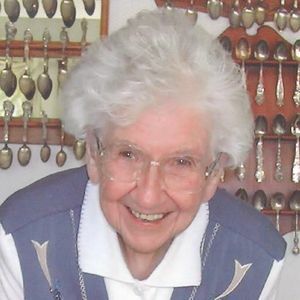 A celebration of her life and an internment at Rose Hill Cemetery in Albion will take place in August 2012. We ask that memorials be made in her name to St. Mark's Lutheran Church, 210 N. Orange St., Albion, Indiana 46701-1029. Farley Funeral Home in North Port, Florida is handling the arrangements. We know how you cared for your mother. Please accept our heartfelt sympathy, Barb and Bill.